One of the benefits of running this site, is that occasionally people will e-mail me with their questions. My favorite is when people ask me if I’ve ever heard of _________, and it’s someone I’ve never heard of. Usually, I’ll do a search right then – but I also add that name to my record list. When Philippe Gassin e-mailed me back in September of last year, I had not even heard of Abdou el Omari. At the time, I did some poking around and found nothing. Then, when looking for material for my radio show (R.I.P. 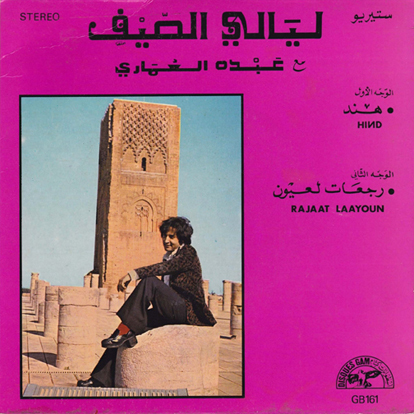 ), I saw that one of his songs entitled “Fatine” had been included on an early cassette compilation that Mississippi Records had released called Chaabi Music From Al-Maghrib. But just recently, I managed to find a little bit more information. Abdou El Omari was born in Tafraout, Morocco in 1945. He is – as the Google translator puts it – “considered among the pioneer generation of musicians who have tried to move the Moroccan song more appealing to the heavens while keeping its original rhythms.” Abdou El Omari died on March 3rd, 2010 in Casablanca. I know that, other than this single, he recorded at least five other songs – but I do not know if that was an album or a couple of singles. If you have any further information, please contact me or leave a comment. Catalog number GB161 on Disques Gam of Casablanca, Morocco. Released 1976. Have you ever heard of Abdallah Chahine? This is fantastic stuff. Thank you for turning me on to it! very cool! wish there was more like this.